White mages: unsung heroes, last priority for most game developers and most-often-yelled-at party member when they accidentally fall asleep on raid night. The white mage is a staple class of any party based RPG which tends to be boring to play, succumbing to simple heals and buff spells on long cooldown timers while you stand aside and let the rest of the team do the handiwork. 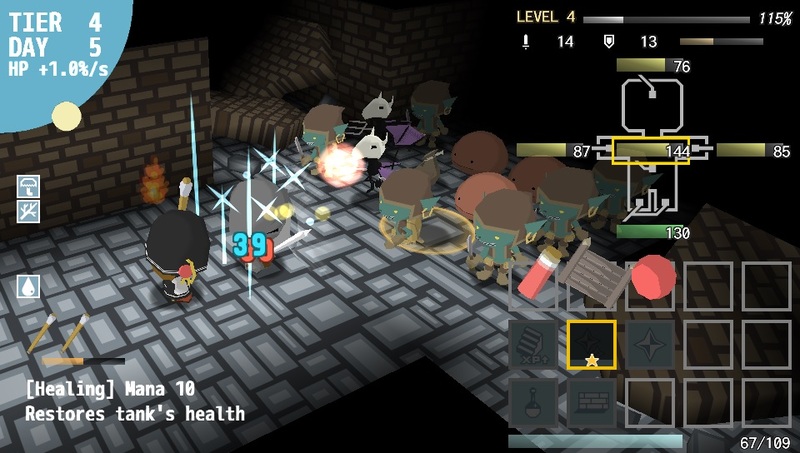 A Healer Only Lives Twice is a casual roguelike developed by Pon Pon Games which plays off RPG tropes, putting you squarely into the shoes of a white mage. 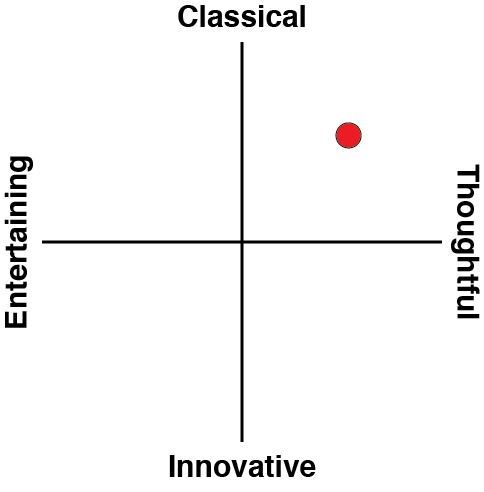 So how does our most important, least appreciated class fare with a game of their own? In A Healer Only Lives Twice, you play as a healer who must tend to his knight buddy as they push through a never ending dungeon. The knight does all the fighting but he doesn't understand much about self-preservation, which is where your medical skills come in handy. While fighting monsters, the knight will take damage onto his head, his arms or his legs, and each limb has an individual health bar that you'll need to manage. Losing a limb means suffering a significant debuff to stats, and losing all the limbs is a game over. 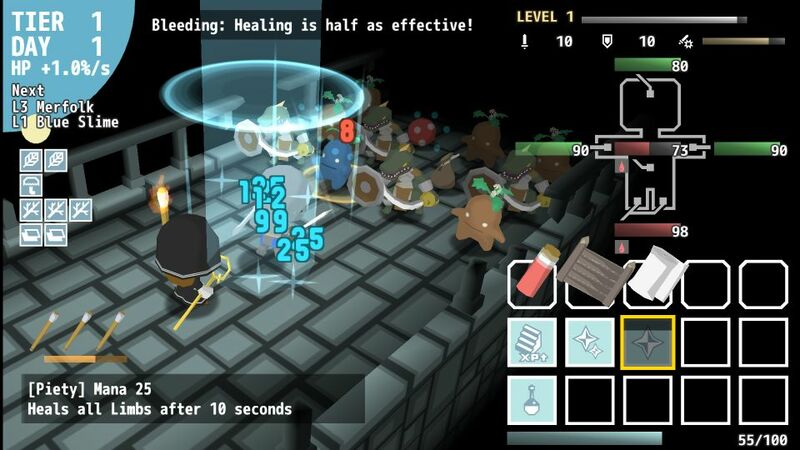 The healer is equipped with a variety of skills to keep the knight healthy. He can cast the basic heal skill to top off a little bit of health, cast a whole-body healing spell or use a variety of buffs and debuffs. Most of these unfortunately aren't too interesting - they work on giving the knight a linear power increase such as a double attack or lowered damage taken. It's likely that you'll gravitate towards one spell you like using and rely on that, and although there are a whole ten spells to master, you unlock access to them slowly and it's much more effective to max each one first instead of getting a little of everything. The more interesting aspect of combat is item crafting, which you'll also need to do on the fly while your knight is fighting. 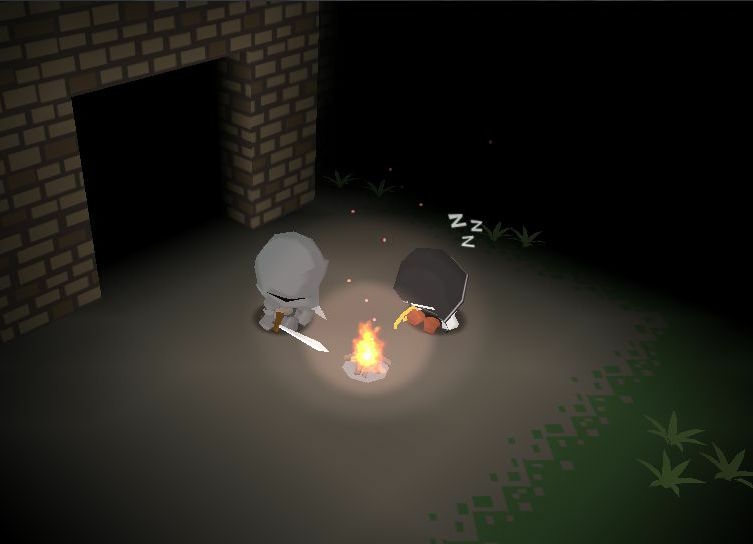 Defeated monsters sometimes drop resources like wood or cloth, and you can combine those into useful items like potions, upgrades for the knight or torches which let you stay in the dungeon for longer. There is quite a bit of randomness to the way resource drops spawn, but this additional layer of depth is welcome. Unfortunately that’s about as far as depth goes. Combat is a simple trading of blows between four enemies and your knight. You do get to choose which enemy he attacks, and thus can plan ahead for what items you will loot and which limbs take more damage, but otherwise you have no agency over combat. If you’re keeping the knight’s health topped up with heals, he will not have trouble with any enemy. There are a few encounters which hit you with status conditions like burn or petrify, but even they feel more like minor inconveniences than anything which requires you to play differently. For the entire duration I was wishing for more depth in the strategy and more player agency. A Healer Only Lives Twice is a roguelike, and permadeath will come along often to spoil your 15-ish minute run. I never found the monsters to be all that difficult, instead the main limiter were torches which were in limited supply - and the fact that you're kicked out of the dungeon when you run out of them. For this reason players will be forced to trial-and-error their way to extending their games and seeing more content. After each run based on how well you did you will be rewarded with points to purchase upgrades for your healer, which thankfully aren’t as linear as the spells you have access to in the dungeons. The perks which carry over between runs are interesting, encouraging you to play the game in a specific way such as focusing on crafting different items, mixing up your skill usage or developing your character in a certain way. I was glad that Pon Pon Games avoided falling into the rogue-lite trap of spoiling permadeath with an upgrade system that provided linear advantages between runs. I only wish that these interesting ideas also wound their way into the dungeon crawling itself. 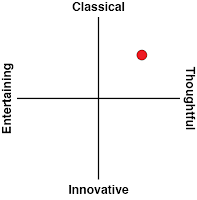 The art and music also faded into routine after extended periods of play. The monsters are cute, but don’t move much or exhibit personality beyond their exterior. There’s no world or context here, so even the greatest art style would become dull after a while. The same can be said about the music, which isn’t bad but loops the same tracks often, discouraging longer play sessions. And that’s the key point in all of this: the easiest way for me to tolerate A Healer Only Lives Twice was to play it in short bursts, before my mind wandered and longed for a meatier RPG experience. I’m sure Pon Pon Games knows this, selling A Healer Only Lives Twice at a low price point, and releasing it on the Vita. The core gameplay is solid, but there’s not enough variety to sustain a long gaming session. What’s left is a game which makes a good first impression and delivers a unique set of ideas, but ultimately gives the same repetitive white mage routine that other RPG’s have been doing for years now.